Steve Johnson has been making driveshafts for over 16 years, and started South Bay Driveline, in San Jose, California. South Bay Driveline specializes in designing custom driveline solutions, and uses Axiline Precison Products driveshaft equipment. There are many subtle things about a drive shaft and the conditions it operates in that will greatly affect how well the drive shaft performs. These subtle variables may have a profound impact upon the life of the drive shaft components, the amount of vibration the driveshaft produces, and whether or not the drive shaft is even capable of meeting your vehicle's specific requirements. 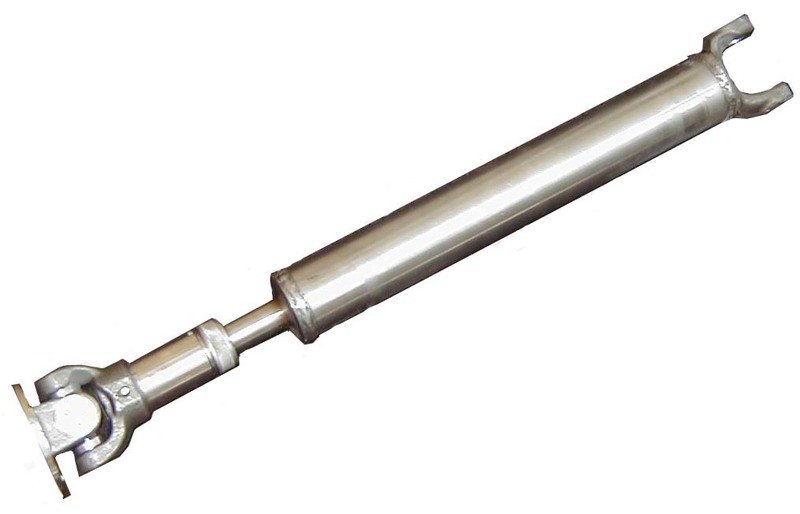 Pictured is a typical drive shaft. It uses a single u-joint at each end of the drive shaft, and a slip spline. As the suspension on your vehicle allows your axle to move as you travel down the road or trail, the slip spline allows for the changing distance between the transfer case output and the axle. 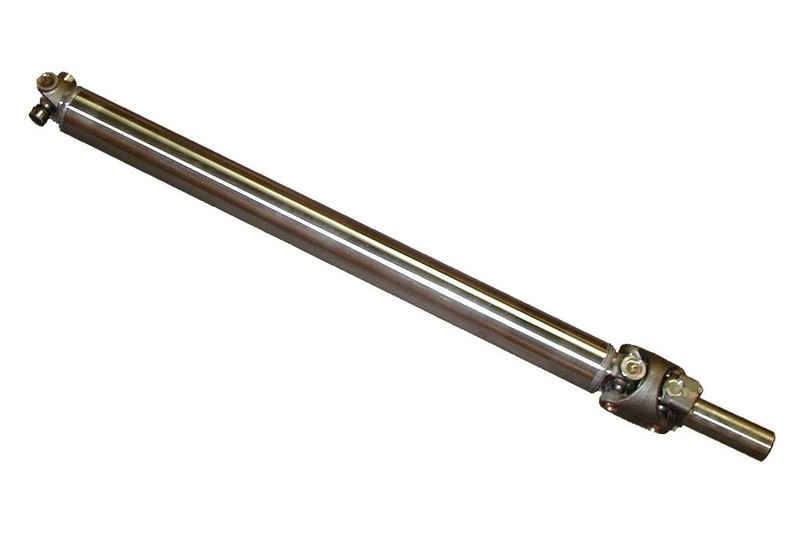 Since there are fewer components used in this drive shaft than a CV-type drive shaft (which we will talk more about later), this will be the most inexpensive type of drive shaft. This type of drive shaft is probably what was used on your vehicle when it came from the factory. When your 4x4 came from the factory it should have come to you with little or no driveline vibration. As time went by you started making your truck yours, adding nerf bars, bumpers, and then... a lift kit. Chances are that suddenly your truck wasn't as pleasant to drive on the highway as it once was. Nagging vibrations keep you from enjoying the drive. What happened?! Driveline vibration is most likely the culprit. The lift kit you installed changed the operating angles of your driveline. The u-joints are now being forced to operate beyond the limits that will ensure a smooth operating drive shaft. To understand why it is that a u-joint creates so much more vibration when the operating angle is increased you need to look more closely at the way the u-joint works. When your driveline has an operating angle of zero (if the output of the transfer case is lined up perfectly with the input to the differential), the u-joint is operating under the best possible conditions. This is never the case though, the u-joint always has a small operating angle. Even if the transfer case and differential were lined up perfectly, as you drive down the road the suspension will allow the axle to move, continually changing the operating angle of the driveline. When there is some operating angle on the u-joint, the path that the u-joint travels in is no longer a perfect circle, it is an ellipse. In the drawing to the right you can see an example of the path the u-joint travels when there is some operating angle present. If the driveline of your vehicle is traveling at a constant speed, the u-joint is actually speeding up and slowing down twice per revolution! Imagine with me... the black circle will represent the path the output of the transfer case is traveling in, a perfect circle. The blue ellipse represents the path that the u-joint must follow when operating at an angle. Since the output of the transfer case is traveling in a perfect circle, and at a constant speed, it should create no vibration. Now look at the path of the u-joint as it travels from point A to point B, it has to travel a longer distance than the output of the transfer case does, so the u-joint is traveling FASTER than the output of the transfer case! After all they both must arrive at point B in the same amount of time... they are bolted together! Now look between point B and point C. The u-joint must travel a lesser distance since it follows the blue path of the ellipse, therefore the u-joint is traveling SLOWER than the output of the transfer case. From point C to point D the u-joint again travels FASTER, and from point D to point A it again travels SLOWER. The u-joint actually must speed up and slow down twice per revolution when it is operating at some angle. Because of the changing speed of the drive shaft the two u-joints (one at each end of the drive shaft) must be in phase. Each one must speed up and slow down at exactly the same time as the other. This is something to consider if you ever take your drive shaft apart, or it falls apart on the trail because the slip spline is not long enough for your vehicle's needs. Care must be taken when putting the two pieces back together so that the u-joints are in phase. If they are not in phase it will create unnecessary driveline vibration. As you adjust the operating angle of the u-joint (by lifting the vehicle, shimming the rear axle, etc) you are also changing the elliptical path that the u-joint must travel in. The greater the operating angle, the less like a circle the path of the ellipse, and the greater the torsional vibration caused by the u-joint. It is for this reason Spicer recommends an operating angle of less then 3 degrees for a u-joint, a very conservative number. It is possible to use the u-joint at an operating angle greater than 3 degrees, but it will likely cause unwanted driveline vibration, which will also decrease the life of the u-joint. If the vehicle is used only on the trail, and only at slow speeds then driveline vibration is not a concern. In this case you would be able to use the u-joint at the maximum angle that the u-joint will still be able to function. The absolute limiting factor for the operating angle of a u-joint is when the yokes holding the u-joint in place contact with each other. This absolute angle is not a set angle, it will depend on the shape of the yokes being used to hold the u-joint. The angle could also be increased by grinding away some of the material in the yokes, right where they contact each other. The u-joint angle must be considered when the suspension is extended as far as possible. If your u-joint is normally operating near the absolutely maximum the joint can handle, when you take the vehicle on the trail the u-joint will have to withstand an even greater operating angle because the suspension will let the axle extend away from the vehicle. The u-joint will then be forced to operate beyond what is physically possible, and FAILURE IS CERTAIN. Take this into consideration when designing your suspension and driveline. Constant Velocity (CV) drive shafts are named so because they do rotate at a constant speed, unlike the typical driveshaft that we talked about above. The most common CV joint for drive shafts is the double cardan.The double cardan uses two u-joints, to split the difference of the operating angle where the drive shaft connects to the output of the transfer case. This joint contains a centering kit to ensure that each u-joint always has the same amount of angle. It is also important to note that the maximum operating angle of a double cardan joint is LESS than the maximum operating angle of a single u-joint. Again, if you wanted a drive shaft that would operate at the maximum possible angle, with no regard to the vibration the drive shaft would cause at high speed, the best choice would be a typical drive shaft with a single u-joint at each end. For any vehicle with a steep drive shaft angle, that must be able to comfortably and reliably drive at freeway speeds, a CV drive shaft is a must. Due to the increased number of parts used in making the CV driveshaft, they will of course cost more than a typical driveshaft. Using a CV shaft also requires you to adjust the pinion angle. In the image to the right, notice the change in pinion angle (the angle of the pinion flange on the differential) in relation to the output of the transfer case. For a CV drive shaft the ideal operating condition is to have the pinion pointed at the output of the transfer case, so that the lower u-joint has no operating angle. Each vehicle will have its own quirks that need to be taken into account when setting pinion angle. For example if the vehicle has significant axle wrap that will allow the pinion to point up higher than desired when accelerating or maintaining freeway speeds, then it may be necessary to set the pinion low, so that when the axle rotates up while under use the pinion angle will be correct. To adjust the pinion angle of a vehicle with leaf springs, you can purchase inexpensive axle shims from your local 4wd parts shop. To install the shims, loosen the u-bolts that hold the springs and axle together, place the shims between the spring and axle, and retighten the u-bolts. Shims should be readily available, and come in increments of 1 degree. DO NOT use multiple shims to get the angle you need. Instead, buy a pair of shims with the angle that you need. Axle shims can be found as large as 6 degrees (possibly even larger), but if you're in need of that extreme of a change it may be time to consider cutting the spring mounts off your axle, and welding new ones on at the desired angle. If your vehicle uses control arms to locate the axle beneath the vehicle (like a Jeep TJ) you may have to purchase adjustable length control arms to be able to adjust pinion angle. These adjustable links will give you the ability to control where the axle sits beneath the vehicle, as well as the angle at which the axle sits. Adjusting the pinion angle of the front axle with shims may have a large effect on steering geometry and wheel caster. If adjusting the pinion angle adversely effects the steering or throws the alignment far off from the specified values, it may be best to return the pinion angle to stock and consider other options. A common, but costly alternative is a high-pinion differential. This will reduce the operating angle of your driveline considerably, and will also keep you driveshaft higher up, and out of harm's way. For some vehicles it is also possible to modify the axle to rotate the pinion up. A shop can cut through the factory welds, rotate the knuckles, and weld the knuckles back in place. Used with either rotated spring perches or axle shims this will rotate the pinion up, but leave the stock steering geometry and alignment in place. Also note, with the pinion rotated up the gear oil level at the pinion will be less, which could starve the pinion gear and bearing for oil damaging them. It may be necessary to overfill the axle so that the pinion receives the necessary oil. The two most common types of drive shafts have been shown here. More creative solutions to extreme driveline problems exist, but it is best to contact a driveline shop to discuss your particular needs. If your local driveline service is not willing to help you find a solution to your unusual driveline problem, you may have to search elsewhere for your driveshaft. Consider calling a shop like South Bay Driveline who is willing to help you find a solution, and will include free shipping to your continental US address.